Interested in custom Flow Factory NW artwork? We do wholesale and custom orders! If you have an idea in mind for your event, organization, festival or business (or even just your own head), we can translate it into a Flow Factory design for hats, shirts...just about anything. Work with Flow Factory NW artist, Chris Herbst, to create your very own custom trucker hat! Anything you want, we'll bring it to life. 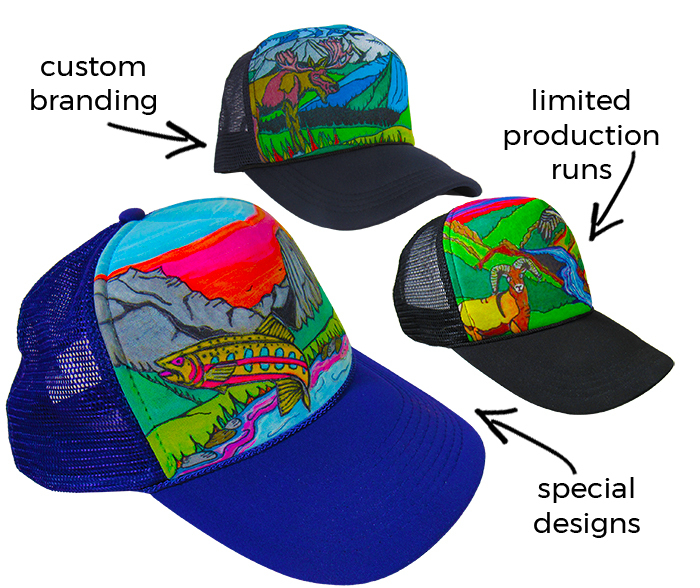 Sunsets, mountains, waves, trees, bright colors - see your favorite scene on a single hand-painted trucker hat. See our product page for pricing and to add a custom hat to your cart. Get 'yer hands on full production runs of custom hats and clothing from as few as 50 to as many as 20,000 at a wholesale price. If you're looking for a colorful way to brand and promote your organization, or want to commemorate an event with a unique style, we'll work with you to make sure your large production order reflects your vision, Flow Factory style.